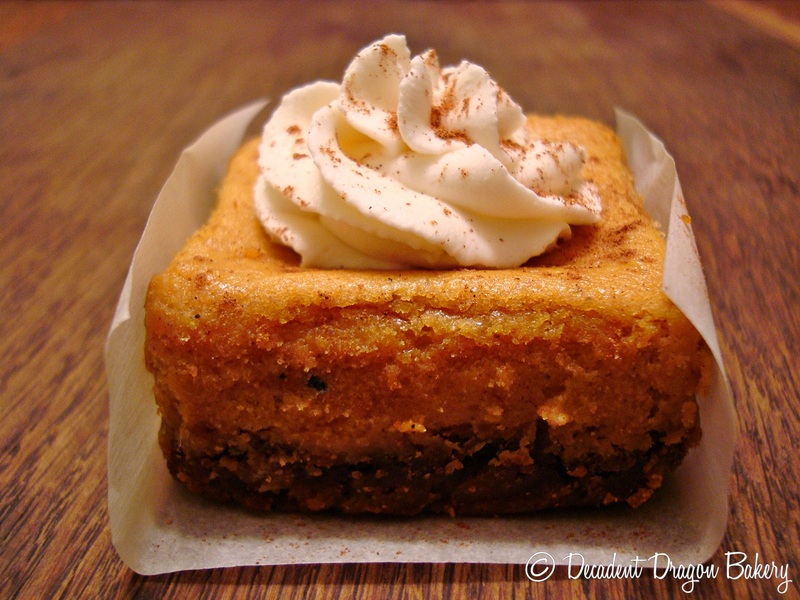 Yesterday, I made these adorable Pumpkin Pie Cheesecake Minis (3 X 3 square) for a local fundraiser at my husband’s work. All proceeds went to the American Cancer Society. His colleagues raised almost $300 in the fight to cure cancer. Way to go, guys! This recipe is so much fun! It produces a cheesecake with fresh pumpkin spice flavor, a crunchy cinnamon-ginger crust and a sinful dollop of bourbon cream. I had recently purchased a Fat Daddio’s 12-Cup Square Muffin Pan (I know, ridiculous name). Let me tell you though, it’s absolutely perfect for making mini-cheesecakes. The pan can also be used for brownies, tarts, or quiches as well. I began this recipe by lining my square muffin pan with parchment paper. I found that cutting a 5″ by 3″ wide strip of parchment made for the easiest cheesecake removal later. You’ll want to be able to pull that little sucker out of there by the ends of the parchment strips. 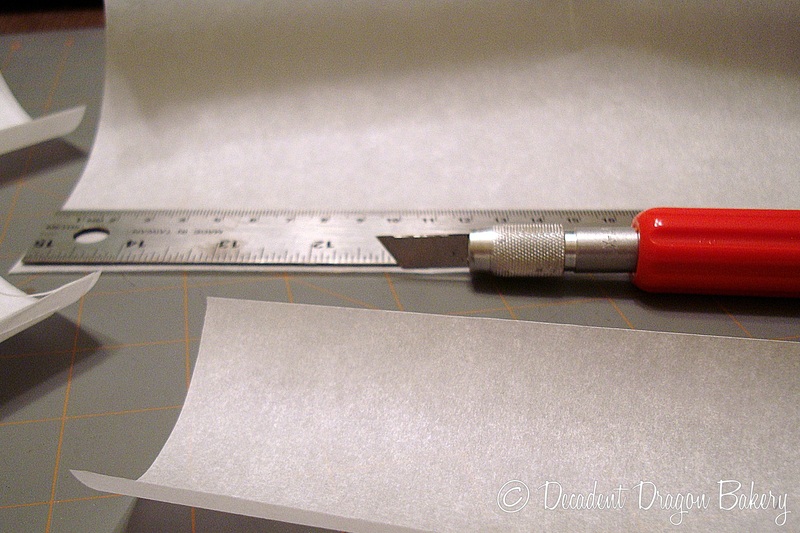 I used a cutting mat, ruler and razor blade but you could use a ruler and scissors, too. 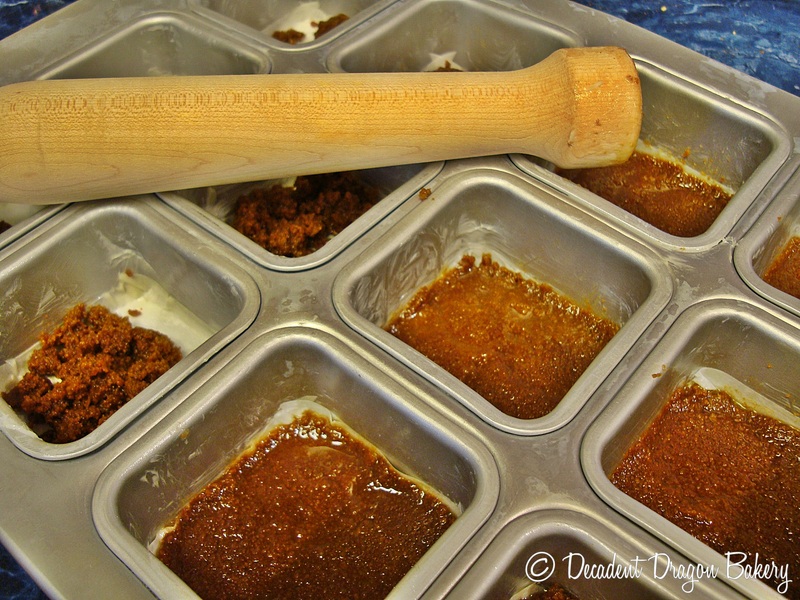 Heheh, anyone recognize the tool I used above to tamp the crust into the molds? I hope you don’t think I’m a complete lush. 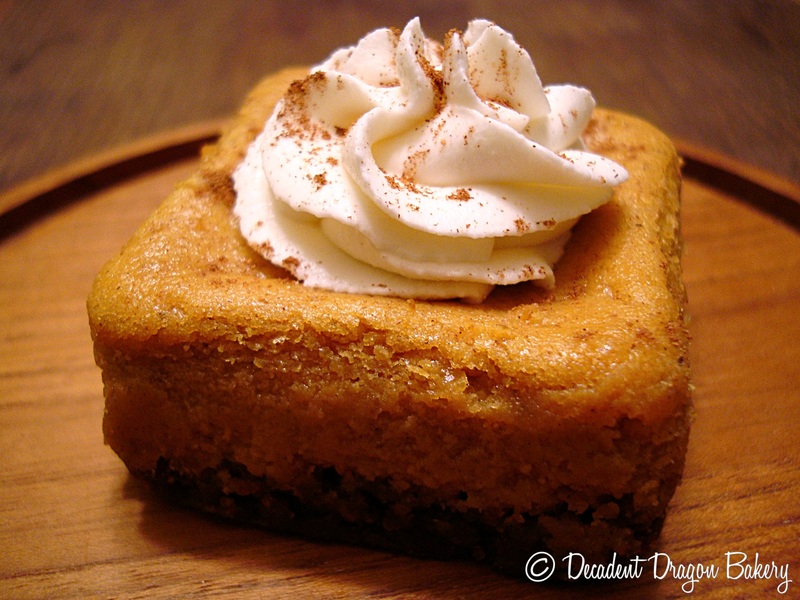 My recipe is heavily adapted from this Betty Crocker Pumpkin Cheesecake recipe I found online. It makes 24 mini-cheesecakes or 1 large 9″ cheesecake. I hope you enjoy it as much as I did. Begin by pre-heating your oven to 325 degrees. Grease your pans with butter, line with cut parchment paper and grease again. Using a food processor, grind up your cookies until finely ground and no large chunks remain. Mix the ground cookies with ginger and the melted butter until combined. Press the cookie mixture into the bottoms of your molds. Bake crust for 8 – 10 minutes or until set (butter mixture should be absorbed). 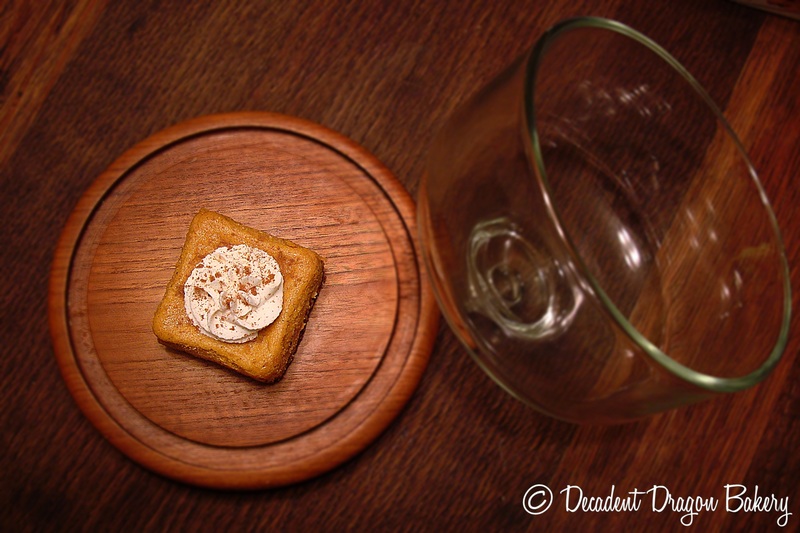 In a small bowl, mix flour, spices, canned pumpkin and brandy together. In the bowl of your mixer, beat the cream cheese until smooth and creamy. (If you see lumps, your cream cheese may be too cold.) Slowly add sugar and then beat the mixture for 3 minutes. You’re looking for a whipped texture, here. Return to low speed, beat in 1 egg at a time until just blended. Gradually beat in pumpkin mixture until smooth. Pour filling into your crusts until 2/3 full. Bake 12-18 minutes, checking often. Cheesecake is done when the center still jiggles slightly when moved but edges are set. Turn the oven off, open the oven door a few inches. Let cheesecakes sit in oven to cool gradually (and avoid cracking). After 30 minutes, remove cheesecakes from the oven and cool on wire racks. When cheesecakes are cool, run a knife around the edges and pull out of pan gently using the ends of your parchment paper. Refrigerate 4-6 hours or overnight before serving. Just prior to serving — Whip your heavy whipping cream until soft peaks begin to form. Add bourbon and powdered sugar and whip until slightly thickened and stiff peaks are just about to form. Spoon or pipe dollops onto your cheesecake. Garnish with cinnamon and ginger.